The Causses and the Cévennes, Mediterranean agro-pastoral Cultural Landscape is a landscape that has evolved over three millennia. It is located in the higher regions of the Massif Central, in an area of granite and limestone slopes and deep valleys. 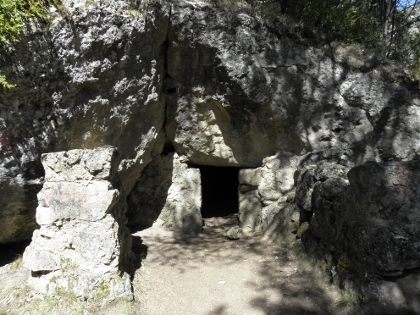 The Causses and the Cévennes WHS covers a really large region, and as others have noticed it is not immediately clear where to go to see its essence (it's a cultural landscape). Driving up north from Toulouse (which takes over 2 hours), I decided to take the highway from Lozère to Millau and take some detours from there. This highway already crosses the core zone by the way. My first goal was to see the Cirque de Navacelles. These "Cirques" are one of the peculiar features of the landscape here. They are amphitheatre-like valleys. Standing on the edge, it looks just like an enormous meteorite has landed. But it was all made by glacier erosion. This site lies at about 28km from the main road. I also saw lots of large birds of prey (vultures?) circling around there. It was back to the main highway then, until I reached Millau. A small mountain road from there reaches further inland, and finally ends at the Chaos of Montpellier-le-Vieux. This is a karst landscape with strangely shaped rocks, just like the Chinese love them. In the summer time it is a very popular tourist site, but I only encountered one other couple at the parking lot. I choose to do the 1.5 hour red hike around the park: a pleasure to just be outside in nature in this fine weather. At the end of that walk I finally encountered two man-made constructions in the landscape that are pointed out in the description of this WHS: a cistern and a cave that has been used for shelter. Both were used by roaming shepherds. In hindsight I could have done with some more time on the ground here. I managed to visit the Millau viaduct also, but did not have enough time for a tour through the sheep's cheese factory at Rocquefort. I would be interested to hear from someone who did make that trip. The World Heritage Site of Causses and Cévennes was not part of the original plan that my friend and I planned to visit during our trip to Pyrenes, the photos that we searched on Google and the reviews were not inspiring for an extra day detour until we found out that the must go of this cultural landscape was the beautiful area of Gorges du Tarn especially the surrounding villages near Sainte Enimie. We entered this World Heritage Site from Ales, we found that the scenery was quite boring with hilly landscape of forest, nothing special except some poor maintenance French villages. The view changed when we reached the town of Florec, from here we started to see the unique landscape that made Causses and Cévennes to be listed by UNESCO, the very large limestone plateau. The deep valley around the plateau was very nice. When we reached the village of Ispagnac, the scenic road was built along the deep canyon of Gorges du Tarn that formed by Tarn River. The canyon was actually very nice and we really surprised to see such geographical phenomenon in France. 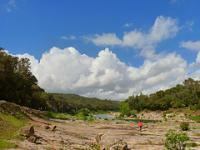 The first place that really worth to mention is the village of Castelbouc. The village is located on the opposite side of the river from the main road on the much lower level from the street view. Actually we could easy bypass this village without notice, fortunately that we saw three motorcycles parked on the small viewpoint ramp, so we decided to stop to see why all those bikers stopped there. The view were amazingly beautiful, the river tarn were emerald green and the whole village of Castelbouc together with its castle ruins and few peach tree blossoms, a perfect welcome sight to Gorge du Tarn. We continued to Sainte Enimie, a very lovely village with sacred spring where we had lunch. 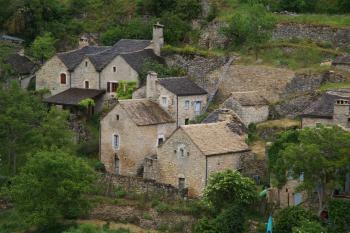 After that we continued our trip to tiny village of Saint Chely du Tarn. Its small road to the village pass thru small tunnel and bridge was already breathtaking, but when we saw the village, we were astonished by the unbelievable view of small village built on many small waterfalls. 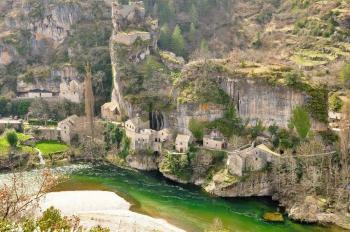 Really one of the most beautiful places I have seen in France and truly the highlight of the trip to Gorges du Tarn. After great time in Saint Chely du Tarn, we drove along the river passed many nice villages that hard to believe their existing on earth to the town of Les Vignes. From here the road started to climb to the top of the canyon. The road was extremely hairpin but the views were absolutely great. On the top of Plateau, the landscape change again, now it became beautiful rolling hills of green grass, almost liked Tuscany, I saw many sheep farms, blossoming peach and apple trees, a very lovely place for farming and gardening. Then we used the highway to see another highlight of this region, the really impressive Viaduc de Millau, a great work of engineering on the way to Bezier. We really enjoyed our day in Causses and Cévennes, its beautiful villages along Gorge du Tarn were really nice places to visit and explore. The limestone plateau and canyon were also quite interesting for its formation, its bizarre shaped rocks were quite OK, if you have not seen those stone forests in Chinese national parks. Although I still not sure what is the outstanding universal value of agro-pastoral landscape, since apart from the canyon, all fertile lands and livestock I saw looked typical for me, nothing special or unique from other French farming areas. However I thought the area deserved to be listed as UNESCO World Heritage Site, but not by the hard to grasp reasons that France currently used. Anyway with carefully planned routes that my friend and I did, I highly recommended to visit this lovely corner of France. I spent several days travelling through this rugged area of the Massif Central. My journey started in Ales, from where I travelled by bus up the Gardon d'Ales and over the Jalcreste Pass to reach Florac in the Cevennes. Here the local mode of transport is the donkey, many named Modestine after the animal that accompanied Robert Louis Stevenson on his travels here. In evidence too are the Protestant churches of the Camisards whose forbears hid here during the periods of reepression. The town features the confluence of the Tarn and Tarnon Rivers, and is overlooked by the cliffs of the Causse Mejean. My journey continued on another bus, this one crossing the Montmirat pass on the flank of Mont Lozere, and finishing at the town of Mende, on the banks of the Lot River. Yet another bus took me from Mende to Marvejols, following the valley of the Lot and the Causse Sauveterre. 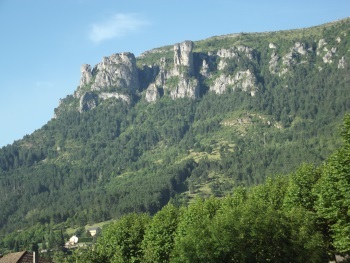 From Marvejols I continued by train to Millau, with spectacular views of the Grand Causses and glimpses of the Tarn Gorge. Millau was spectacular for the views afforded of the viaduct. Passing beneath the viaduct on a side trip to Saint Affrique gave another perspective. 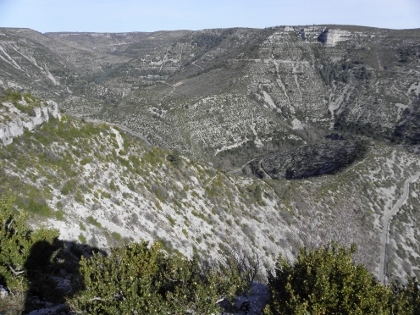 The agro-pastoral landscape of the Causses and Cevennes spreads over a wide area and consists of high plains (Causse Méjan, Causse Noir, Causse du Larzac), mountain ranges (Cevennes, Mont Lozère, Mont Aigoual) and narrow gorges (Gorges du Tarn, Gorges de la Jonte). Not easy to figure out which sites are worthwhile to get the best impression of both the natural heritage and the rural architecture. Thus, I studied extensively the nomination dossier, identified some places that seemed to be the most interesting, and finally planned our route for the two days we had scheduled for this WHS. We started early in the morning in Le Puy-en-Velay and after 1.5 hours we entered the core zone at the northern slopes of the Mont Lozère massif. The narrow road (D20) goes close past the highest summit of the massif, the Sommet de Finiels, to Le Pont-de-Montvert. We had a first stop near the summit for a short hike. Actually, it is a high plateau rather than a steep peak, a sparse and stony landscape with conifers and yellow broom. Apart from us there was nobody around and the morning fog made a bit of a spooky atmosphere. Le Pont-de-Montvert is one of the larger villages in the area. We bought some cheese and the obligatory baguette to get through the day, and continued our trip heading towards the Gorges du Tarn. We took the narrow road D35 and came past lonely barnyards and through small hamlets, and saw some typical examples of rural architecture (eg the church in Fraissinet-de-Lozère or the bell tower in the village La Fage). The houses are made of granite stones, low and compact to withstand the harsh weather, but they are of a rough beauty. However, many of the houses and farms seemed to be uninhabited. In Ispagnac begins the narrowest and most beautiful part of the Gorges du Tarn. The road leads along the western river bank through some lovely villages like Sainte-Enimie (one of 'Les Plus Beaux Villages de France'), Sainte-Chély-du-Tarn, or La Malène. Here, the buildings are made of limestone, but similar to the granite architecture at Mont Lozère also plain and massive, in harmony with the nature around. The most picturesque villages are on the eastern bank: Castelbouc and Hauterives (photo), the small houses seem to glue on the steep slope. Hauterives can only be reached by foot, there is no street. The gorge is a popular tourist destination, in particular with canoeists. We learned that many of the houses have been restored and are used as summer and weekend cottages. In Vignes, a winding road branches off towards Point Sublime, a viewing point with a great panoramic view of the Gorges du Tarn, the short detour is worthwhile. The gorge ends at Le Rozier. When we arrived there, it was early enough to visit the Chaos de Montpellier-le-Vieux. Like Els, we took the red walk and enjoyed our hike through the rock formations with curious names like 'Crocodile', 'Door of Mycène', or 'Large Sphinx'. We stayed overnight near Millau, where we also visited the Millau Viaduct. For the next day, we actually had planned a longer hike in the Causse Méjan (a hike in one of these austere and almost deserted Causses must be very contemplative). But the weather was cloudy and windy, so we skipped our hike in favour of a visit in Roquefort. We took a guided tour at the Roquefort Sociète, the largest cheese manufacturer in Roquefort. The tour (1 hour) started with an animated model explaining the geology that formed the cave. At the next stop we saw a 'fleurine' - one of the narrow fissures that extends through the entire rock and allows air circulation, a unique feature important for the maturation of the Roquefort. Then we watched a film on the history and the process of cheese making, followed by a rather dispensable sound-and-light-show. Too much of that multi-media stuff for my taste. The caves themselves were rather disappointing. We expected a high vaulted cellar, similar to an old wine cellar. But the cave was divided into various levels by timber floors, the levels were not much higher than a normal room. Behind acrylic glass we saw rows of cheese wheels stored on wooden shelves. The guide explained the different steps of Roquefort production and demonstrated how a cheese wheel is wrapped in a thin sheet of pewter, obviously also an important step. The tour was in French, but there are explanatory panels in various languages. Finally, we tasted three different types of Roquefort. The tour was not bad, but I don't think that Els has missed a lot. However, the caves could be more interesting at one of the smaller manufacturers. 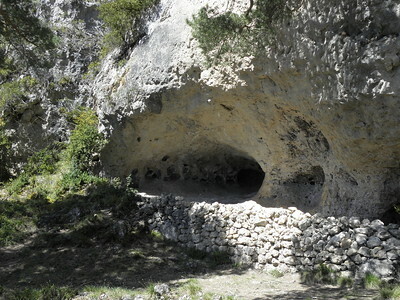 After that we had short stops at the Templar sites Viala du Pas de Jaux, Sainte-Eulalie-de-Cernon, and La Couvertoirade. The latter is the most interesting, like a smaller copy of Carcassonne, but not a must-see. 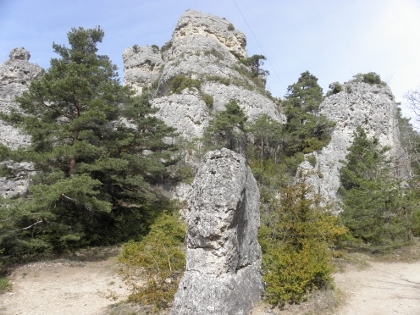 Finally, we had a last stop at the Cirque de Navacelles, also mentioned in Els' review above. All in all, an interesting and probably underrated WHS, with worth seeing natural sites and intact rural architecture. We saw the pasture landscape, we saw barns for sheep, drinking troughs (lavogne) for sheep, and a cistern, we tasted sheep's cheese, and we met a woman selling sheep's wool, but in two days we never saw a sheep! I visited this vast WHS in April 2012. I enjoyed the picturesque landscape contrasts of garigue, trees, streams, etc. Best to visit by car on a sunny day and then enjoy trekking and hiking in the countryside. Knights Templar : It was the leadership of the Knights Templar and Hospitaler that brought real development to the Causse plateaus. Knights Hospitaller: It was the leadership of the Knights Templar and Hospitaler that brought real development to the Causse plateaus. Transhumance: "The northern part of the Cévennes NP encompasses the grazed granite uplands around Mont Lozère. Here (is) .. good summer grazing by large flocks of sheep travelling north from farms to the south of the National Park in Languedoc near the coast, a system of transhumance that has persisted since the 12th century"
106 Community Members have visited.